We attended the Council for Affordable Health Coverage’s premier policy event earlier this month to hear from representatives from all corners of the healthcare industry. HHS Secretary Alex Azar, along with representatives from Blue Cross Blue Shield, GlaxoSmithKline, the National Patient Advocate Foundation, and the Problem Solvers Caucus—just to name a few—came together to discuss Medicare for All, why preserving the Employer-Sponsored Insurance (ESI) system is critical and potential solutions to rising healthcare costs. 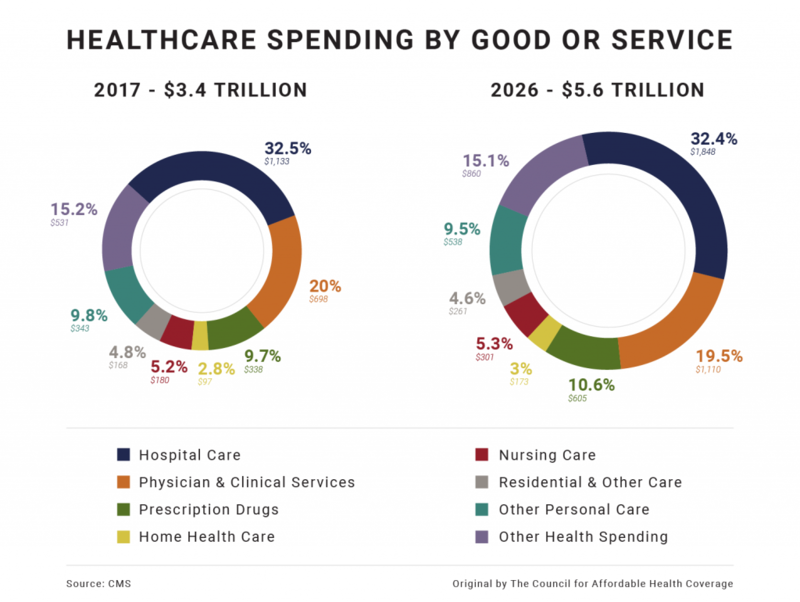 The problem: Between 2017 and 2026, The Center for Medicare and Medicaid Services (CMS) predicts that health spending will grow 71 percent. The largest expense? Hospital care. If current trends persist, the typical family will spend more than 50 percent of their income on healthcare by 2030. The ACA is a cautionary tale of what happens when we rely on changes in insurance to address medical cost drivers. Potential solutions to rising healthcare costs focus on addressing industry concentration and consolidation (e.g., surprise medical bills); facilitating the coordination of care; disclosing prices for care as well as provider quality and safety performance and expanding the use and availability of claims and clinical healthcare data. Employers are the most overlooked stakeholder, yet ESI covers about 181 million Americans. According to panelists, Mary Grealy, president of the Healthcare Leadership Council, and Anne Phelps, U.S. Health Care Policy Leader at Deliotte, the employer-sponsored market is the most successful at managing costs and implementing innovative solutions, like telehealth and clinical wellness initiatives, in part because it moves at a faster pace and invests (long term) in providing comprehensive coverage to its employees. However, employers could do more to leverage their negotiating power to control costs. Delay and ultimately repeal the Cadillac Tax. Modernize Health Savings Accounts (HSAs) to entice eligible employees and their dependents to use them. This issue has received bipartisan support in the Senate. Address the rising costs of specialty drugs, as they are responsible for 23 percent of total premium costs. Health Reimbursement Arrangements (HRAs) are one of the biggest potential disrupters to the individual market due to the rule proposed by the Trump administration to allow employers to offer HRAs integrated with individual insurance coverage. The Treasury Department predicts that 10 million employees would obtain coverage through an HRA as a result of the proposal, although critics argue it may impact the individual market as sicker employees are incentivized to purchase individual insurance. Note: The Council attended this event in connection with the coalition, Partnership for Employer-Sponsored Coverage (P4ESC), which is an advocacy alliance that is committed to preserving and strengthening employer-sponsored coverage. Click here for more on P4ESC.